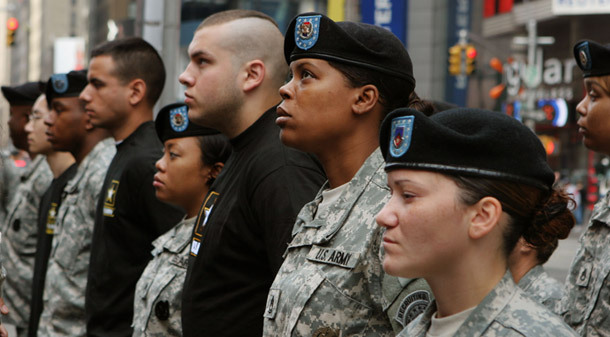 As the U.S. military seeks to expand by an additional 48,000 ground troops over the next four fiscal years, the armed services—and the Army in particular—are faced with the challenge of enlisting highly qualified and motivated men and women. Several recent developments have created an opportunity for increased recruitment, including the reduction in causalities from the Iraq war, the election of Barack Obama—who has pledged to withdraw the bulk of American troops from Iraq—and rising unemployment among today’s youth. But as the ground forces strive to recruit a sufficient number of troops, the military’s “Don’t Ask, Don’t Tell” policy continues to undermine their efforts to attract qualified men and women. Moreover, since its enactment, this outmoded law has cost the country hundreds of millions of dollars and thousands of service men and women who were working to keep our country safe. Since 1994, the military’s “Don’t Ask, Don’t Tell” policy has resulted in the discharge of more than 13,000 military personnel across the services including approximately 800 with skills deemed “mission critical,” such as pilots, combat engineers, and linguists. These are the very specialties for which the military has faced personnel shortfalls in recent years. In 2005, the Government Accountability Office found that the cost of discharging and replacing service members fired because of their sexual orientation during the policy’s first 10 years totaled at least $190.5 million. This amounts to roughly $20,000 per discharged service member. Analysis of GAO’s methodology, however, shows that the $190 million figure may be wildly off the mark. A recent study by the Palm Center, a think tank at the University of California, Santa Barbara, found that GAO’s analysis total left out several important factors, such as the high cost of training officers—commissioned soldiers, sailors, Marines, airmen, and Coast Guardsmen with several years of service experience—who were discharged due to their sexual orientation. When these costs were factored in, the cost to the American taxpayer jumped to $363.8 million—$173.3 million, or 91 percent, more than originally reported by GAO. Even putting aside the human and financial costs of “Don’t Ask, Don’t Tell,” the policy is no longer supported within the military nor in civilian society. A December 2006 Zogby International poll found that 73 percent of military personnel said that they were comfortable interacting with gay people. More importantly, of those who responded to the question, “Do you agree or disagree with allowing gays and lesbians to serve openly in the military,” roughly 63 percent of respondents either agreed or were neutral. A recent ABC/Washington Post opinion poll found increasing civilian acceptance of gays serving in the military. Seventy-five percent of Americans in the poll said gay people who are open about their sexual orientation should be allowed to serve in the military, up from 62 percent in early 2001 and 44 percent in 1993. These views are shared by those in the upper ranks of the military as well. General John M. Shalikashvili, the Chairman of the Joint Chiefs of Staff when the “Don’t Ask, Don’t Tell” policy was enacted, no longer supports the policy. He now believes that allowing gay men and women to serve openly in the military would no longer create intolerable tension among personnel or undermine cohesion. With U.S. military and public opinion now firmly in opposition to “Don’t Ask, Don’t Tell,” it is time to put an end to this outdated, discriminatory policy—before it imposes further costs on our budget and our national security. 1. The 13,0000 figure cited above assumes a continuation of 600 service members discharged per year for 2007 and 2008.